Gosh it’s the end of November already. This month has felt both long and short simultaneously. I’m not normally a fan of November – it’s a bit of an in between month full of dark, damp, cold weather and I tend to just keep my head down and get on with things. This year we seem to have squeezed quite a lot in and now suddenly there is only one more chapter left of 2018 before we start a brand new year. I swear it was only January a few weeks ago? Ever since October half term I’ve started taking my book with me when I pick Ella up in the car from her high school. Its usually only about five minutes or so that I have to wait for her but I’ve been quite enjoying diving in for a few pages and immersing myself in another world whilst the chaos of the car park continues around me. Plus I really hate wasting time – after all, we only have so much of it each day – and so it feels good to be using it to do something positive for me rather than just mindlessly sitting there. Especially when it’s something I love to do that I don’t make time for during the rest of the day. 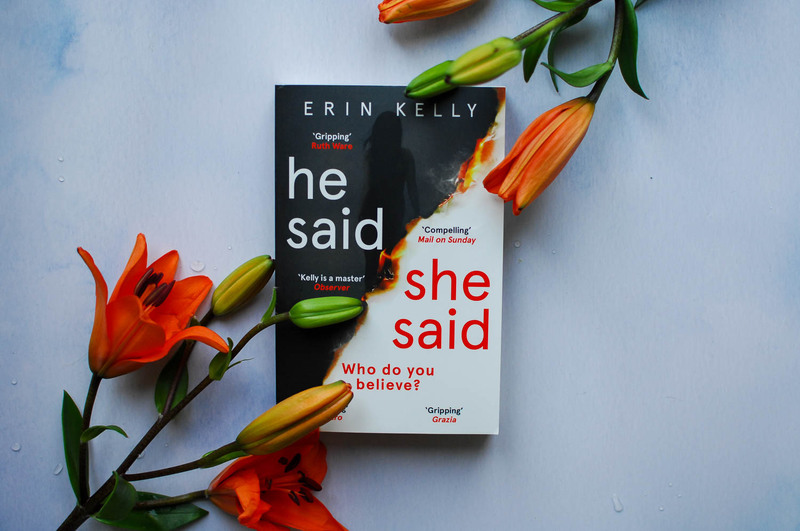 The only book I’ve read this month has been ‘He Said She Said’ by Erin Kelly and honestly I couldn’t put it down! I even stayed up way past the time I would normally head off to bed so that I could finish it, which is unheard of for me. There were twists all the way through that I wasn’t expecting, it really kept me guessing and I was totally absorbed in it. I still couldn’t figure out how it was going to end until literally the very last sentence and even that completely took me by surprise. I really loved the storytelling – the shifting backwards and forwards between the different characters and years kept it fresh and the character development was brilliantly detailed. I did find it quite hard to read sometimes due to the topic it covered: the storyline is set around a sexual assault and the resulting court case (I imagine it could be triggering for some, just as a word of warning), but it was definitely worth persevering with. The husband and I have been gradually working our way through The Big Bang Theory Season 11, which is finally on Netflix. It’s such a silly programme but I do love it (almost as much as Friends, and that’s saying something). It makes me giggle and that’s something I very much need at the end of a long day. The husband has been away on an adventure for a week (more about that later) and so I took the opportunity to watch some of the shows that I like to watch that he doesn’t enjoy. Well, I watched one show. Two episodes of it. That counts, right?! To be honest, once the girls were in bed most evenings were spent catching up on emails, doing admin, researching Christmas and birthday presents, editing photos and writing. In complete silence. It was lovely 🙂 The two episodes I did manage to watch were from Season 1 of ‘This Is Us’. I’ve been wanting to watch it for absolutely ages and I’m so glad I’ve finally started it – it’s exactly the kind of show I love to lose myself in: the way everyone’s lives intersect and connect with each other; the careful telling of each person’s story; and how real and relatable every character is. I’m already deeply invested in these people and can’t wait to find out how the rest of the story unfolds. There have been no cinema trips for us this month – we’re still eagerly awaiting the opening of a brand new cinema in our town at the start of December. Instead the girls and I had a movie night at home one Saturday evening when the husband was at work and I introduced them to the magic of ‘Labyrinth’ and David Bowie as the Goblin King. I wasn’t sure whether they would like it or not, after all, it’s pretty old fashioned compared to the slick and stylish films they’re used to seeing nowadays. Thankfully they loved it and next on our list is The Never Ending Story, one of my favourites when I was younger. 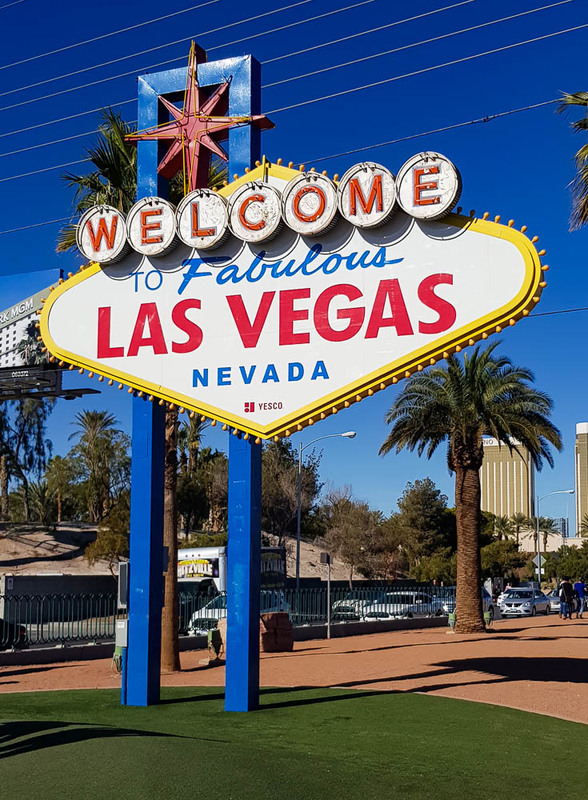 Ever since I first met my husband fifteen years ago his biggest travel goal has been to go to Las Vegas. He celebrates a rather special birthday at the end of December and so, as a birthday present to himself, this month he finally made that dream come true. He and his best mate spent a week in Las Vegas experiencing everything The Strip has to offer and even made it to the Grand Canyon. Thanks to the wonders of WhatsApp video calling the girls and I managed to speak with him almost every day and we heard all about what he’d been up to – as you can imagine he had many stories to tell! and this shot of the Grand Canyon! It was the teenager’s seventeenth birthday at the start of the month and we always like to make a bit of a fuss of her. The husband took her up to Manchester to see her favourite You-Tuber live on stage whilst the girls and I stayed home and made her a surprise birthday cake. Because her birthday is so close to Guy Fawkes Night we decided to make her a bonfire cake and I’m pretty pleased with how it turned out. Chocolate fingers for logs, crumbled digestive biscuits for ash, melted-then-cooled fruit sweets broken into shards for the flames and a battery-operated tealight nestled in the middle to make it glow like a real bonfire. I’ve also been busy making plans for all the other birthdays we have coming up next month – Ella turns twelve at the start of December, the husband reaches the big 4-0 just before Christmas and Lola will be nine just after New Year! Trying to co-ordinate celebrations for everyone can be a bit of a logistical nightmare but it’s certainly a fun time of year. I have finally managed to find myself some ripped skinny jeans that actually fit me (hurrah!) and so I’ve been living in them for the last couple of weeks. I like to wear them with oversized jumpers – I hate being cold and winter is almost upon us so staying warm is definitely my top priority at the moment. Way back at the very start of November, when it was still half term (which feels like forever ago now!) we spent a lovely day out at the National Trust’s Charlecote Park with my best friend, her husband and their now eight-month-old little girl. The last time we saw them was on our mini road trip back in May when she was only ten weeks old so the change in her was huge. They live down in Southampton so Charlecote Park (or ‘chocolate farm’ as Mimi likes to call it after mis-hearing what I said when I told her where we were going!) is sort of half way (ish) between us. We’d never been there before and it was a gorgeous place to explore – the property was beautiful and there were gardens, deer and plenty of parkland to wander around too. As I mentioned earlier, the teenager went to see her favourite You-Tuber for her birthday and she asked me to do her hair for her in ‘boxer braids’. I am NOT good at doing hair. At all. A simple plait or bunches is about the best I can do and I didn’t even know what boxer braids were so I’ll be honest – I was feeling the pressure! I watched a couple of You Tube tutorials to get a rough idea of what they looked like and how to do them and then had a go. It took me several attempts and a very long time (she was so patient! ), but I’m pretty pleased with how they turned out, even if they were slightly… wonky. I think Sophie was pleased with them too. It sounds ridiculous considering I’m 35 years old but I truly felt like I’d passed some kind of motherhood/womanhood test! I absolutely love this photo of Sophie! We enjoyed our tradition of having sparklers in the garden for bonfire night and Lola found the courage to join in this year too. She’s terrified of fireworks so it was a big thing for her and I’m so proud of her. We took advantage of an absolutely beautiful, sunny, Sunday afternoon a couple of weeks ago to enjoy an autumn walk as a family at Moseley Old Hall, another National Trust property we’ve not been to that’s actually only about half an hour away from us. 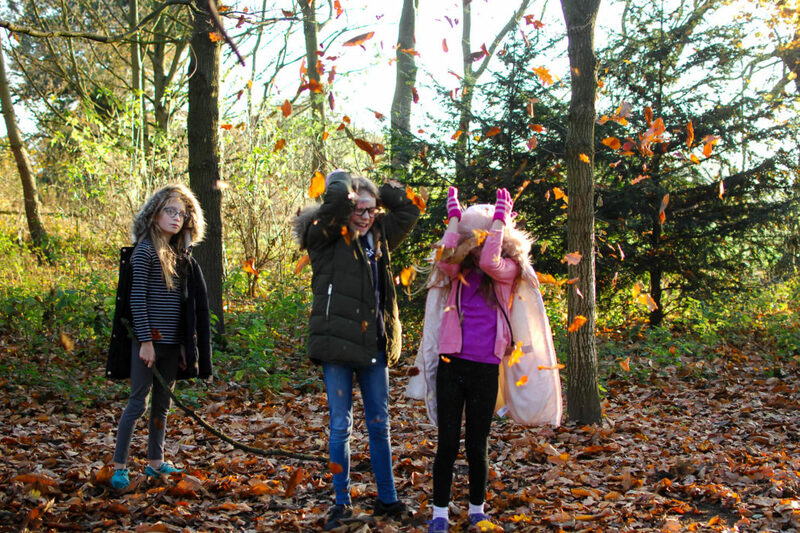 I’ve no idea why we’ve not visited before – it was a lovely little place with gorgeous gardens, a woodland walk that had a thick carpet of dry leaves, an adventure playground to play in and the most fantastic treehouse I’ve ever seen! We didn’t go in the house itself as we ran out of time but I know for sure that we’ll visit again come Spring and Summer – I’m certain that each season will bring different kinds of beauty and fun things to do, and with it being so close it might just become a new favourite place to explore. I had a little* (*quite big) realisation whilst we were there and wrote this post all about it. There are plenty more photos of the gorgeous golden light that inspired me plus my girls doing what they do best – having fun and being themselves. During my week of solo parenting whilst the husband was away in Vegas, Ella had an inset day from high school whilst the other two (still at primary school) didn’t. I decided to make it a ‘lovebombing’ day (sometimes called a ‘yes day’) – I cleared my diary of work and all other obligations and focused solely on her, telling her that we could do whatever she wanted (within practical time and money limits). Considering she could have chosen for us to do absolutely anything at all she chose quite modestly to do the things she currently really enjoys: tea and cake at her favourite café followed by shopping for clothes for her birthday in a couple of weeks time; then an afternoon snuggling on the sofa watching her favourite YouTube videos (we caught up on Mummy Daddy Me’s latest Orlando vlogs and Amanda Rach Lee’s most recent bullet journalling spreads). They were such simple requests but they made her so very happy and we spent a really lovely day together chatting and laughing and cuddling. She’s still talking about it now so it must have made a real impression on her. I forget sometimes just how much one-to-one attention can fill them up and make them feel so very loved – I need to create space to do it with Mimi and Lola at some point soon too. Looking ahead to December I can already tell that it’s going to be ridiculously busy – even more so than usual. As I mentioned we have a LOT of birthdays coming up in the next few weeks (and all the celebrations with family and friends that go along with them), plus all the usual school events, various festive activities & traditions that we always try and do in the lead up to Christmas, as well as one of the busiest times of year work-wise for both the husband and I. I honestly wouldn’t have it any other way – it’s chaotic and tiring but they are very small prices to pay for the fun we’re going to have and the memories we’re going to make together. You’ll have to let me know what you think of the book Gail – I wasn’t sure what to expect but it had me gripped from the very beginning. I hope that you and your family have a lovely festive season too – see you on the other side! Stunning photos! And what a wonderful way to spend the day with Ella. I love how she chose such modest things and was so happy just to spend time with you. I’m also a school run car park reader. I used to get so much reading done while waiting for my little one to finish school but fell down the rabbit hole of instagram stories but I’m determined to start reading again, which I started today. Rather jealous of your hubby’s trip to Vegas, mine would like to do the same although he may have to wait another 10 years as he just turned 40! Have a wonderful December with all those birthdays coming up. That cake is amazing by the way!